Garnier Vineyards located at Mayerdale was planted in 2002. 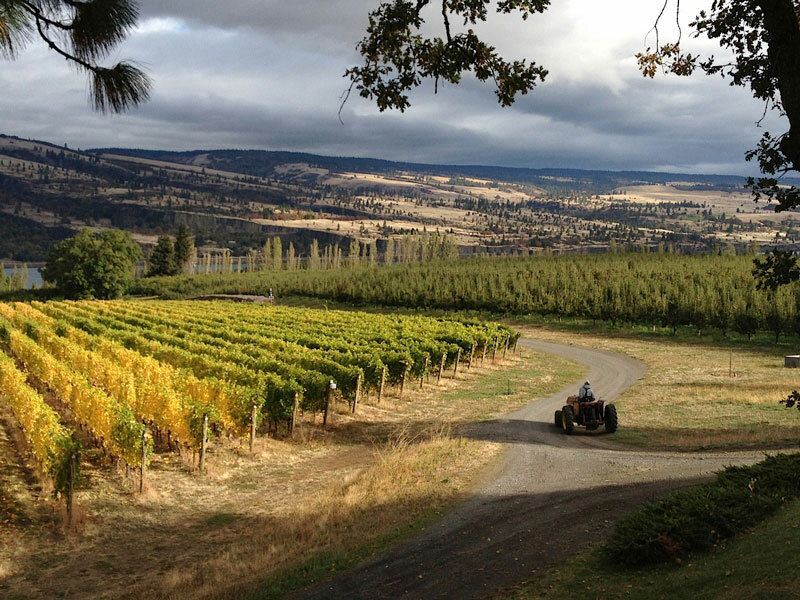 The site is located on the western end of the property and overlooks the Columbia River. The history of Mayerdale begins in 1908 somewhere in New York City. At the time Mark A. (Markie) Mayer was living at the Hoffman House Hotel near Madison Square. It is uncertain where the idea sprung from but having gentlemen farms or trophy farms was not uncommon for the wealthy. Mark Mayer was a wealthy man during his time as were many of his friends and acquaintances. One of these friends and a close friend was James Brady or better known as Diamond Jim Brady. Diamond Jim had purchased such a farm a few years prior to Markie, in 1901 it was located in South Branch, New Jersey a vacation area and he called it Ellesdale Manor Farm. Mr. Brady proceeded to lavish every means and expense to improve it, one for the sake of impressing his railroad customers and two to provide meals that would “make the gods weep with envy”. It may have been Markie’s trips to this farm or the still fresh instinct of men to be drawn to a rural setting. In 1908 the Oregon Railroad & Navigation Company (O.R.& N.) published a brochure entitled “How to get to Mosier Oregon”. This publication was circulated all over the western world. Why this publication attracted Markie and why people would want to know how to get to Moiser is the subject of this history. As the story was told to me, Markie, Diamond Jim and a gentleman named Bernard Weller were up one night having a good laugh over the publication. 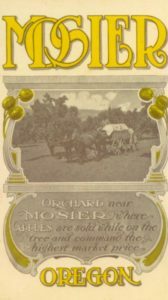 The railroad was boasting that Mosier was one of three places in the west where locally grown fruit could be transported cross-country or even overseas without spoilage. Before the time of refrigeration this would have been an important asset. At the time Markie speculated that they could sell apples for a dollar a piece on the streets of New York as well as pickled eggs to all the clubs and stores. They had a good laugh on how a farm in Mosier would be just another get rich scheme that was sure to work. Whether this is what actually happened would be hard to know but following this reported discussion Markie purchased 232 acres of land just east of Mosier from a George Sellinger and proceeded to upgrade the property to a standard that was in keeping with Diamond Jim’s Ellesdale a place that would impress any visitor and produce a quality product without comparison. The Mosier Bulletin, a local newspaper of that times reported that Mr. Mayer remodeled the Sellinger home grandly and to the point that one could no longer recognize the former residence. In addition to the home Mr. Mayer built lavish chicken coops, out buildings and a home for his foreman. The barn was stocked with draft horses to work the farm as well as all the amenities to create a state-of-art going concern. 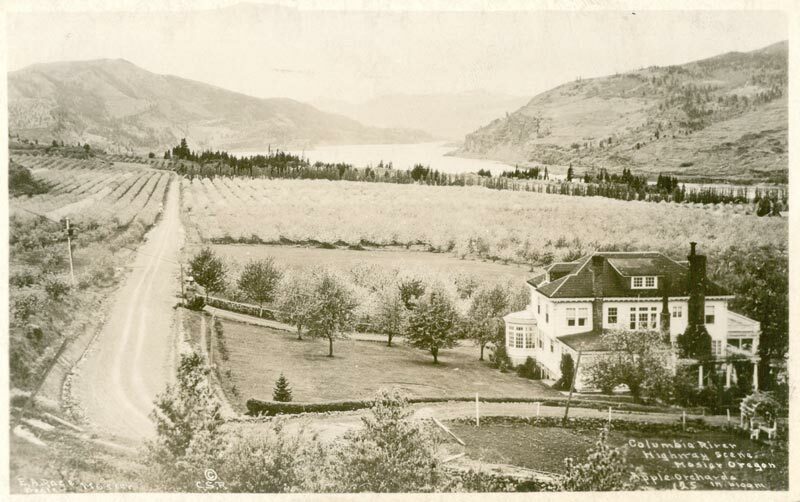 The Mayerdale estate was originally established in June of 1910, located just east of Mosier, Oregon on the old scenic Columbia River Highway (US Highway 30). Mayerdale Orchard & Ranch as it was originally referred to, provided various fruits, eggs, and farm produce to the general economy. From the head of this 232-acre property stands the original estate home. The house completed in 1913 is a Colonial Revival style with all the amenities. The front of the home faces west with a breathtaking view of the Columbia River where it begins its westward trek through the Cascade Mountain Range. 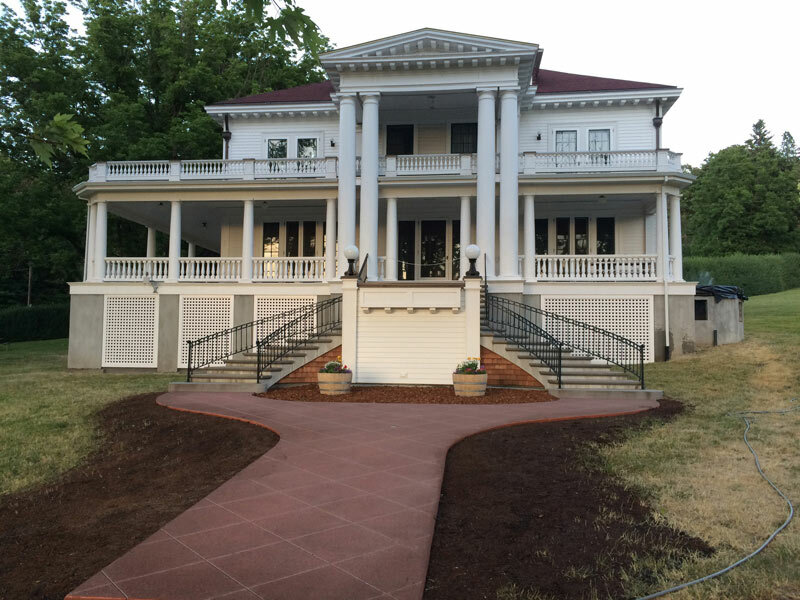 Colonial Revival is an architecture style created by the renowned firm of McKim, Mead & White. 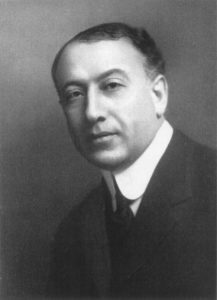 Standford White, the most infamous member of this firm was likely an acquaintance of Mr. Mayer’s, if not his friend. It is not known who actually designed the home but is more likely that it was influenced, if not designed, by the Whidden & Lewis architecture firm of Portland, Oregon who built many homes of this style during this period. William Whidden, one of the principles of this firm originally came from McKim, Mead, & White in early 1880 to be the chief architect for the new hotel that Henry Villard had commissioned with McKim, Mead & White. Whidden & Lewis went on to build many home of this style in the greater Portland area. Mayerdale may have been one of them.